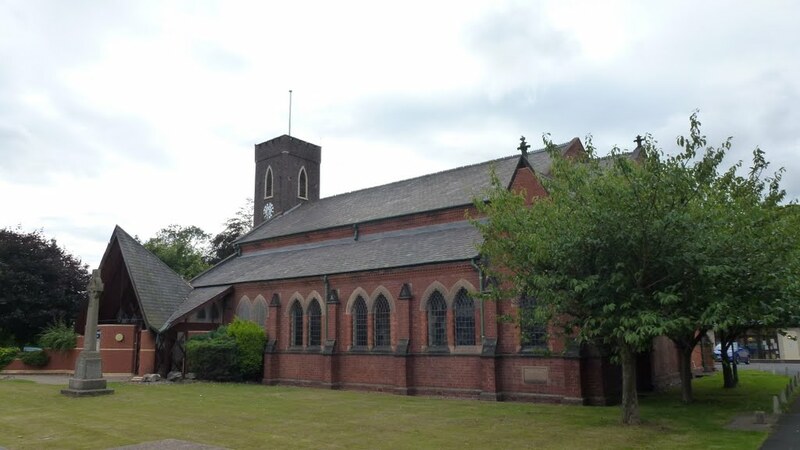 Sad news – Home and away matches of Walsall Wood and Pelsall Villa FC today (Saturday 10th March 2018) both cancelled due to waterlogged pitches. Sadly following a pitch inspection, today’s Walsall Wood match at oak park is OFF. Walsall Wood FC were due to face Wednesfield at Oak Park this evening. 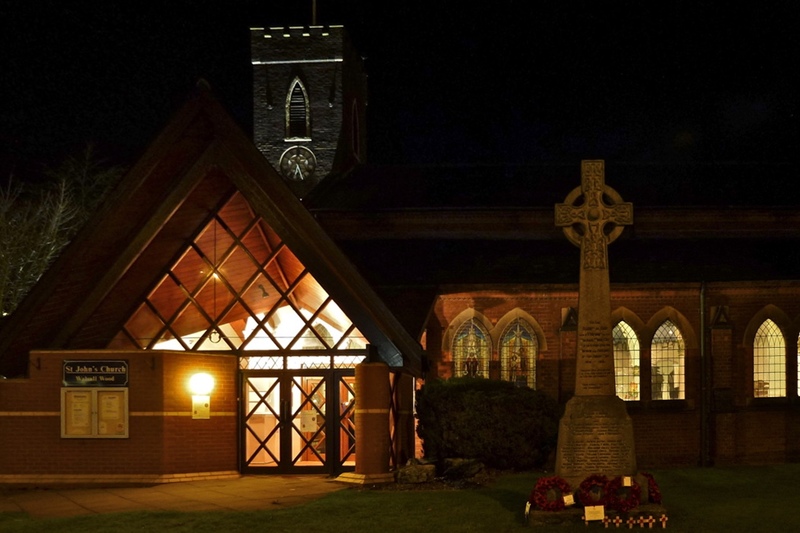 Sadly, it’s been cancelled due to a waterlogged pitch. A stonking away win for Walsall Wood again last Bank Holiday Monday (28th August 2017) as they demolished Chelmsley Town on the astroturf at Coleshill. Walsall Wood play Chelmsley Town at Coleshill this afternoon! 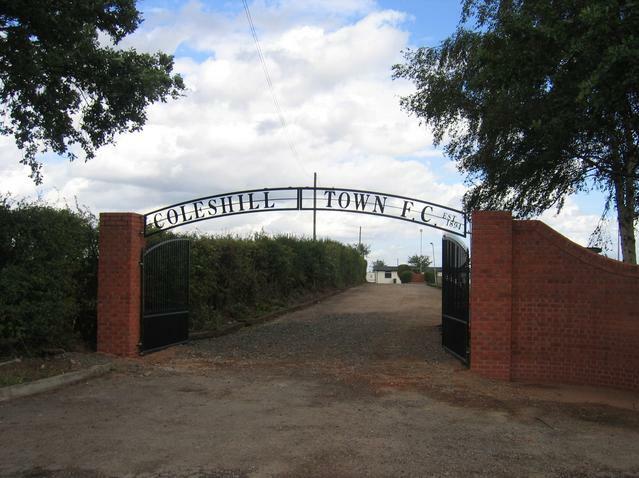 Your chance to catch Walsall Wood away at Coleshill this today! Yet again, football at Walsall Wood FC’s Oak Park ground is cancelled this afternoon (Saturday 6th February 2016) due to a waterlogged pitch – and the second time in a row now that a home match to Lougborough has been cancelled due to the weather. Yet again, football at Walsall Wood FC’s Oak Park ground is cancelled this afternoon (Saturday 2nd January 2016) due to a waterlogged pitch. 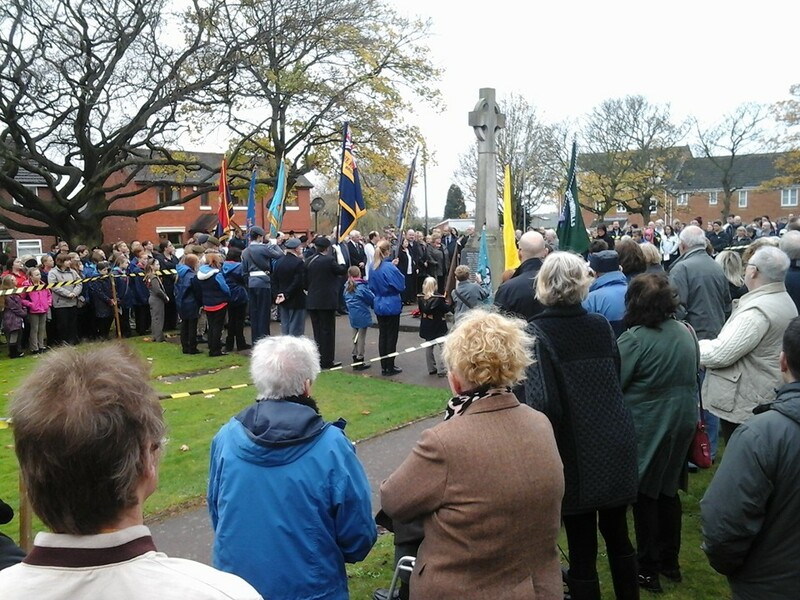 After posting the photos of the Walsall Wood Remembrance event on Sunday, I received a bit of an indignant enquiry as to where the photos of the Brownhills Remembrance Parade were. 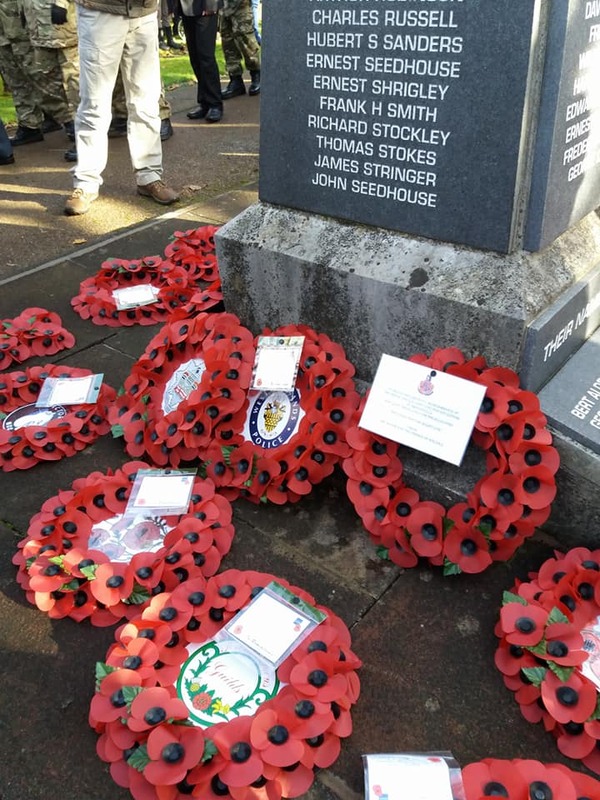 Just a quick one – The young David Evans today went to his local Remembrance event in Walsall Wood, which regulars will remember has been the cause of some controversy this year. 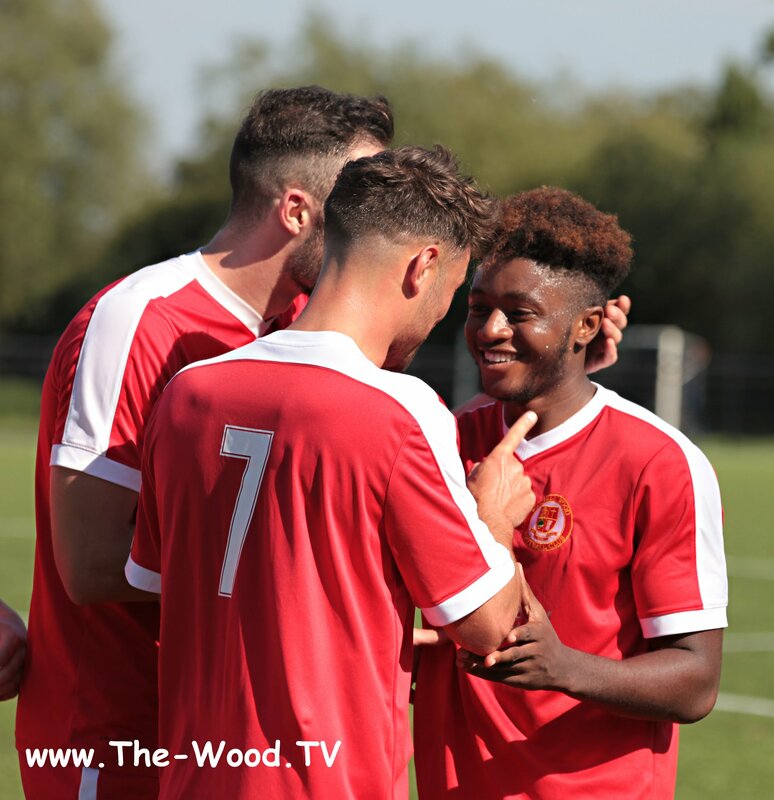 Your chance to catch Walsall Wood FC away to Bilston Town in a friendly this afternoon! 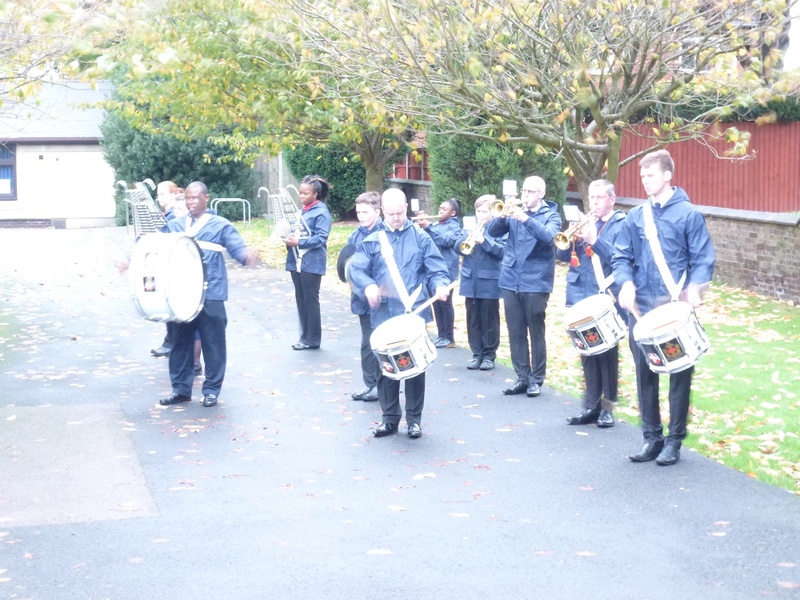 Your chance to see Walsall Wood in action against Coleshill this afternoon! 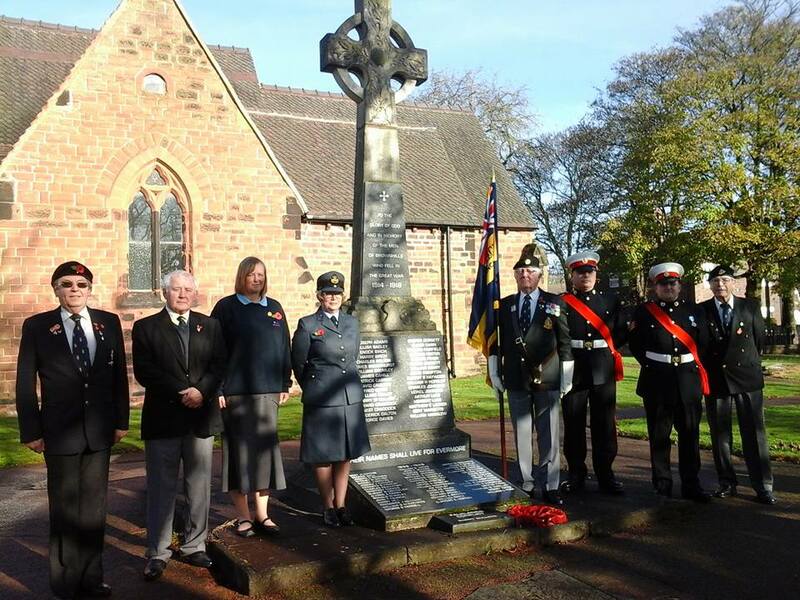 The anger and irritation in the community over the curtailed Walsall Wood Remembrance Sunday parade rumbles on – and since I last posted, a few things have been said, and clarified, so it’s important interested parties read this post to understand what’s gone on. 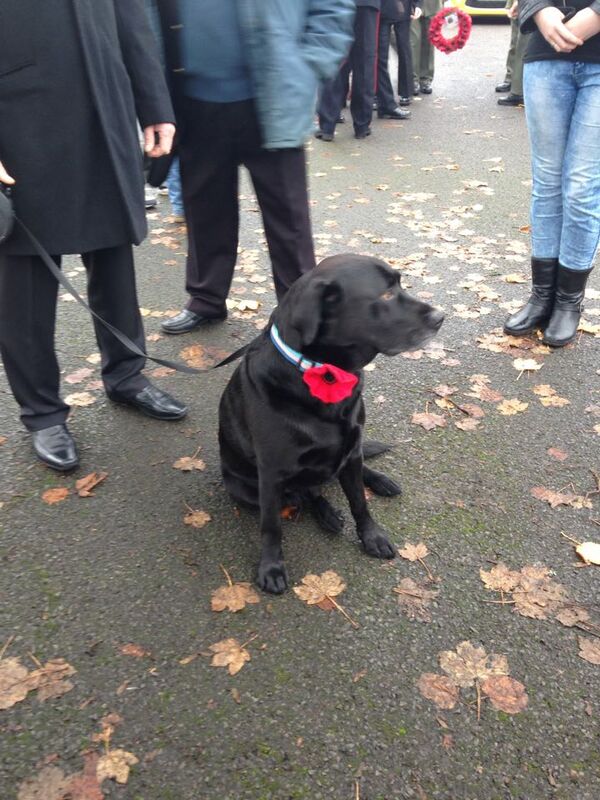 Walsall Wood Remembrance Parade – what a mess! 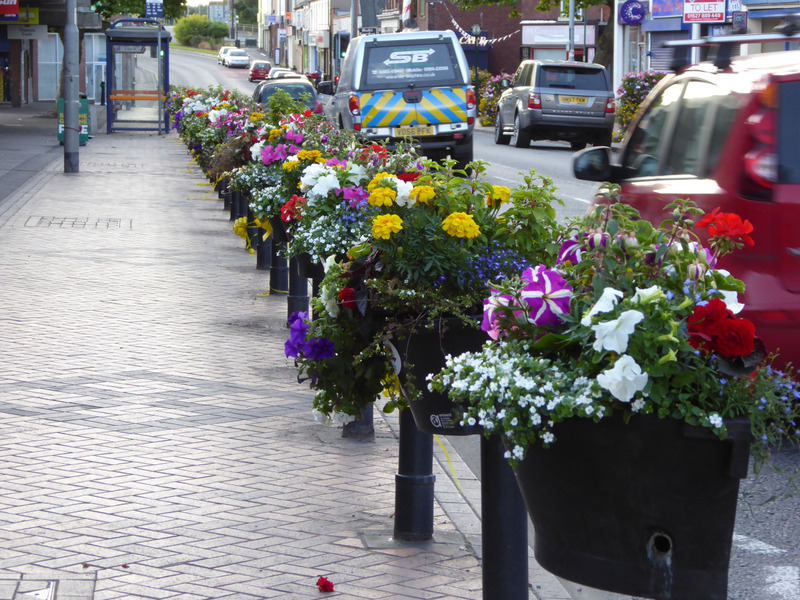 It’s been an odd day today – sometimes you get stories on the blog that are initially very complex, but get simpler as they untangle; this one is the absolute opposite, and all I can do is post the information I currently have for you to make you own minds up. 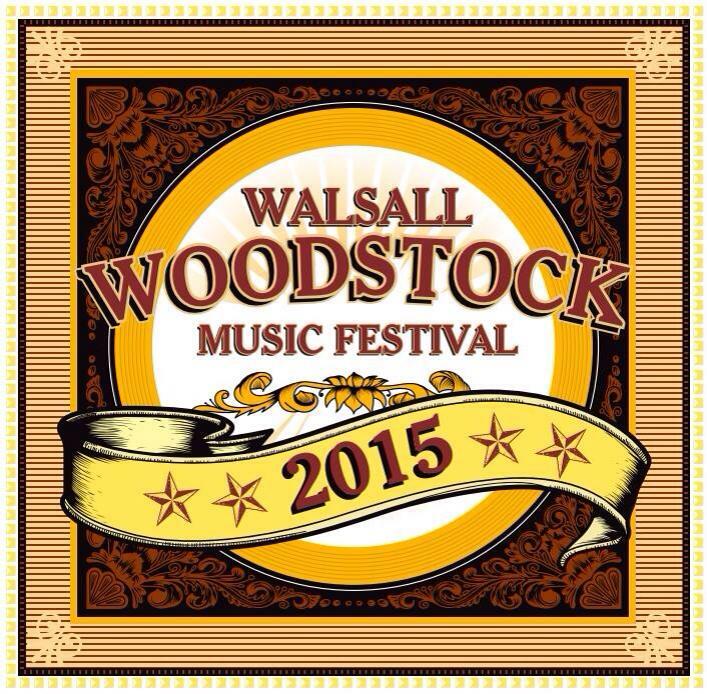 Sorry folks – I turn on the computer to find the sad news that Walsall Woodstock – the pop festival scheduled today and tomorrow for Walsall Wood Football Club – has been cancelled. Walsall Wood away match at Coleshill cancelled! 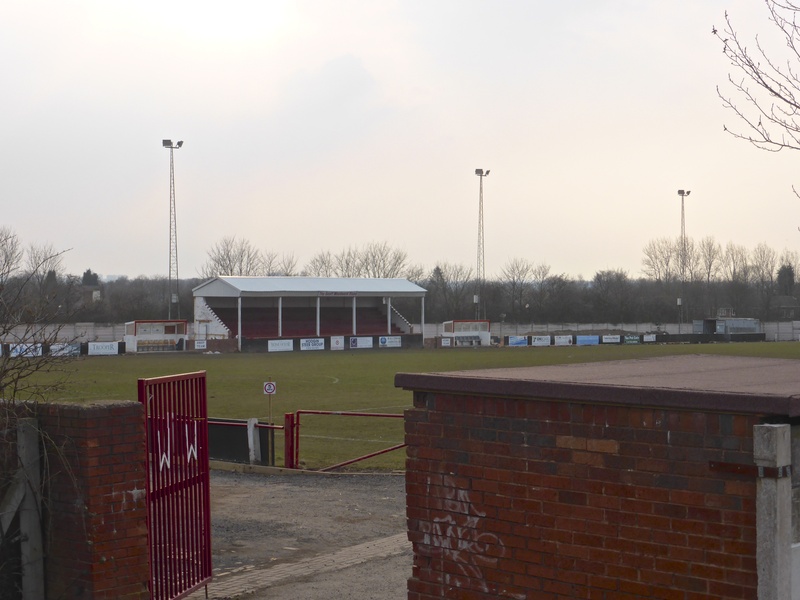 Bad luck, folks: Walsall Wood FC have announced via their twitter stream that the away match at Coleshill Town has been called off due to a waterlogged pitch. Wood v Alvechurch game cancelled! Walsall Wood v. Alvechurch match off due to waterlogged pitch! 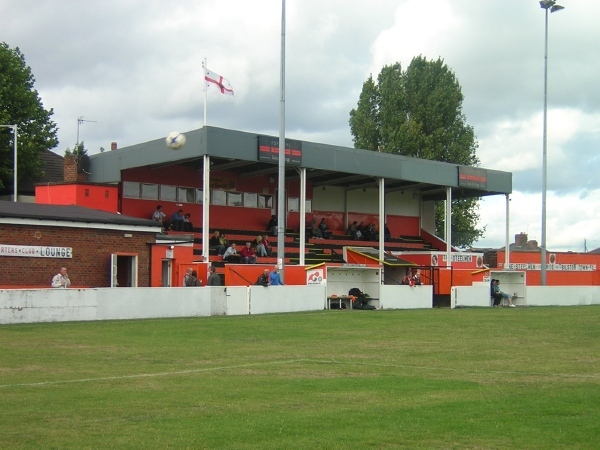 Today (24th January 2015), Walsall Wood FC were supposed to be off to Barnsley to replay their tied FA Vase match against Shaw Lane Aquaforce, which hung in a one-all draw last Saturday; sadly following a pitch inspection, the match was called off. 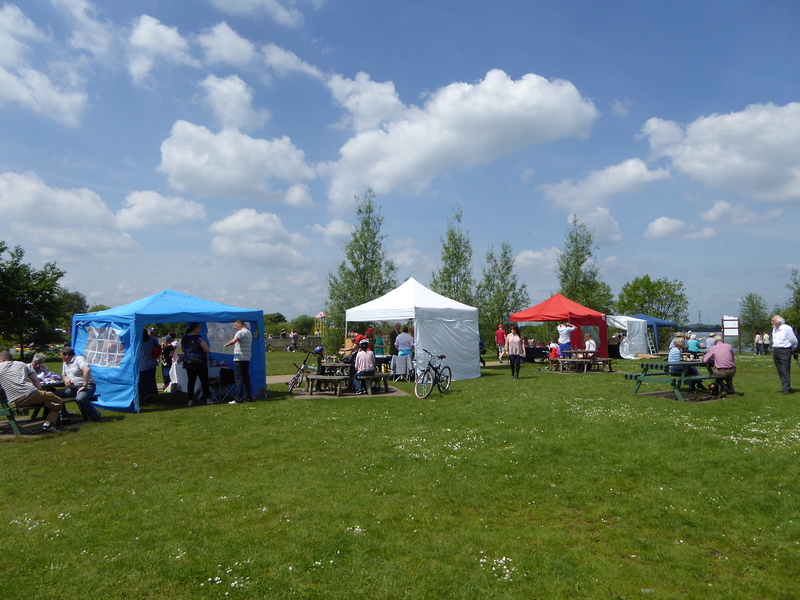 Just a quick heads up that this Sunday (7th September 2014), there was to be a Craft and Farmers Markets staged at Chasewater, which has been cancelled, with the organisers Bohemian Bunty pulling out of the monthly event. Walsall Wood v Shepshed Dynamo home match this afternoon is off! 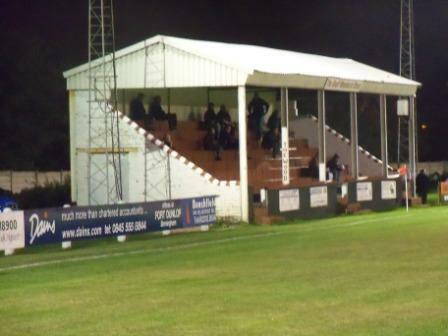 Yet again, Bill Shaw has been in touch with the disappointing news that the Walsall Wood FC – Shepshed Dynamo home mach scheduled for today (15th February 2014) at Oak Park has been postponed due to the terribly wet pitch. Walsall Wood v Gornal home match this afternoon is off! It will come as no surprise at all to fans of The Woodmen that the Walsall Wood FC – Gornal Athletic home mach scheduled for today (1st February 2014) at Oak Park has been postponed due to yet another waterlogged pitch. Walsall Wood v Stourport Swifts home match this afternoon is off! Bad news for fans of Walsall Wood FC – the home mach scheduled for today at Oak Park against Stourport Swifts has been postponed due to yet another waterlogged pitch. Walsall Wood v Rocester away match this afternoon is off! Walsall Wood v Coventry Sphinx home match this afternoon is off! 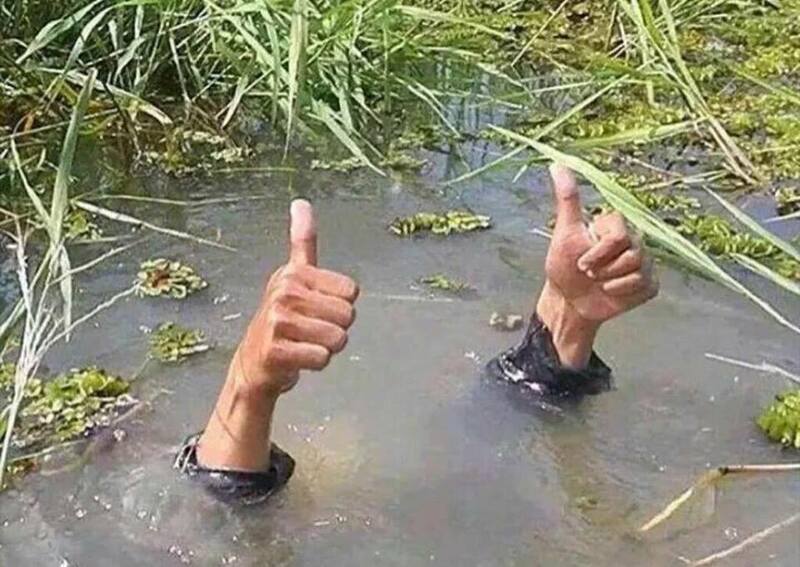 A message just in from Bill Shaw to tell readers that this afternoon’s home match at Oak Park against Coventry Sphinx is cancelled due to a waterlogged pitch. Walsall Wood v Tividale away match this afternoon is off! Walsall Wood v Heath Hayes away match tonight is off! 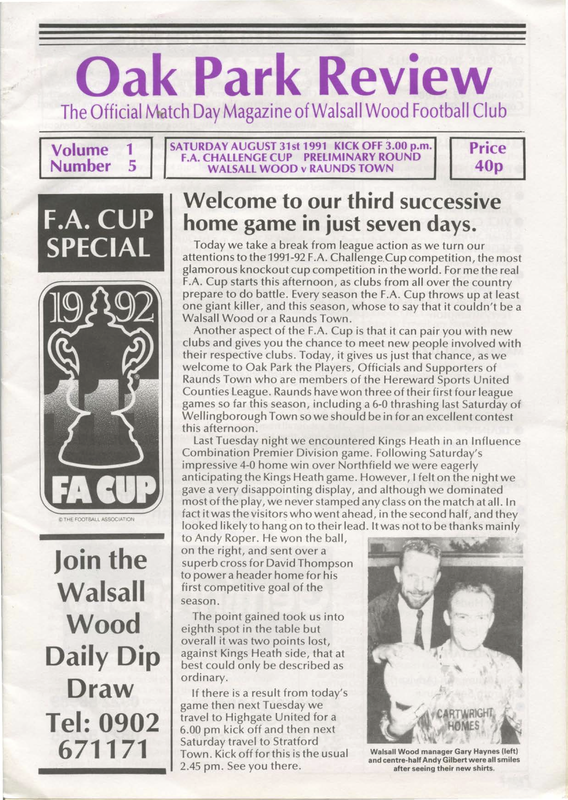 Here’s something I recently came by in a charity shop in Brownhills – it’s the match day program for Walsall Wood FC versus Raunds Town FC, played at Oak Park at 3pm, Saturday 31st August 1991 The cover price was 40p, and this is a hefty 20 page A4 magazine with lots of content. Walsall Wood v The Mikes match off! A quick massage from Bill Shaw to tell readers who may be planning to go watch The Woodmen thrash The Mikes this afternoon that the match has been cancelled due to a waterlogged pitch.